Cesar Altieri Sayoc is pictured in Ft. Lauderdale, Florida, U.S. in this August 2015 handout booking photo obtained by Reuters, Oct. 26, 2018. U.S. federal agents have arrested a man in Florida in connection with a series of mail bombs sent to critics of President Donald Trump, including Democratic Party politicians. U.S. Attorney General Jeff Sessions identified the man as Cesar Sayoc of Florida. He said Sayoc was charged with five crimes, including mailing explosives and threatening a former U.S. president. Sessions made the announcement on Friday in Washington. Christopher Wray, the director of the Federal Bureau of Investigation, said officials have recovered 13 of the mail bombs. He said the pipe bombs were “not hoax devices” and could cause explosions. Wray added that investigators had matched fingerprints and genetic material on the bombs to Sayoc. Sayoc was arrested at an automobile parts store in the city of Plantation. He lives in Aventura, a town nearby. Court records show Sayoc has had past arrests for making a bomb threat, theft and other wrongdoing. Officials were seen on television examining a white automobile at the site of the arrest. The vehicle’s windows displayed images of Trump, American flags and what appeared to be small signs of the Republican National Committee and CNN. This image obtained Wednesday, Oct. 24, 2018, and provided by ABC News shows a package addressed to former CIA head John Brennan and an explosive device that was sent to CNN's New York office. Pipe bombs found across the U.S. The development came as officials found and safely removed at least 13 pipe bombs at sites across the country. Several mailings were addressed to Democratic Party politicians, including former President Barack Obama, former Vice President Joe Biden and former Secretary of State Hillary Clinton. Several of the packages were sent through a U.S. mail office in a town less than 10 miles from where Sayoc lived. The return address for the mailings was that of Democratic lawmaker Debbie Wasserman Schultz. New York Police stand outside the Time Warner Center at Columbus Circle, Wednesday, Oct. 24, 2018 in New York. A police bomb squad was sent to CNN's offices at the center, and the newsroom was evacuated because of a suspicious package. 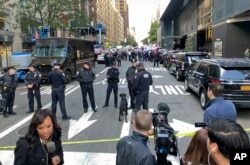 On the same day, officials removed a mail bomb in CNN television offices addressed to John Brennan, a former director of the Central Intelligence Agency under Obama. He also is a fierce critic of President Trump. Two other mail bombs were sent to Representative Maxine Waters, a California Democrat who has clashed with the president. One addressed to Eric Holder, who served as Attorney General under Obama, was sent return mail to the office of Wasserman Schultz. She is a former chair of the Democratic National Committee. A day later, investigators found three more pipe bombs: one sent to actor Robert De Niro and two to former Vice President Biden. Both are major critics of Trump. On Friday, officials said they discovered three more mail bombs addressed to Senator Cory Booker of New Jersey, Senator Kamala Harris of California, and former National Intelligence Director James Clapper. The one to Clapper was addressed to him at CNN’s New York office. Clapper told CNN that he was not surprised he was targeted and that he considered the actions an act of terrorism. ​The U.S. holds elections November 6 that could bring a change of political party control to Congress. Hai Do wrote this story for Learning English with additional reporting from the Associated Press. Caty Weaver was the editor. match - v. to have the same appearance, color, etc.